Treat your special ones by ordering online this Breathtaking Daily Routine Care Kit for them and show how special a place they hold in your heart. This Care Kit is introduced with Nike Deo, Parachute After Shower Cream (100 gr. ), 1 Bottle Pantene Conditioner - Total Damage Care (75 ml. ), Pantene Shampoo - Total Damage Care (180 ml. ), Fiama Di Wills Shower Gel - Refreshing Pulse for Men (250 ml. ), One Tube Himalaya Face Wash - Purifying Neem (50 ml. ), 1 Carton Park avenue Deo Soap - Good Morning Freshness (125 gr. ), Use n Through Gillete Presto Razor (2 Pc. 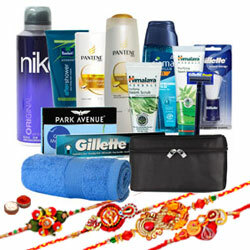 ), Gillete Shaving Cream, Gillete Shaving Brush, Body Scrub, Towel and Travel Kit with 4 Rakhis and Roli Tilak Chawal.